The following Blog Review is an official entry to Kaye and Pehpot's Blogversary Contest. If you haven't encountered this blog yet, read on to find out why it's worthy of a visit. Stalkers always scare me. You never know what's on their mind. You never can tell what their intentions are. So that I always find myself with a companion whenever I go out, especially at night. But there is one "stalker" who you should NOT be scared of. His name is Vladimyr, who loves Russian names so much he named his son Klashnicov, and who writes Stalking Minds. The blog is set in a two-column layout, with dark gray for the background and olive green for the header. The body's text color is done in white so that the words are very readable. I find the blog, which is published on WordPress platform, very easy to navigate. The About page, which most readers will look for the first time they visit a website or blog, is readily available under the Who Am I tab. 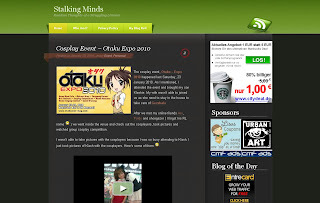 The blog features different stuff that interests the author, the latest being the CosPlay Event. There are also lots of useful stuff and personal entries in his blog, hinting that he is a family man and is passionate about them. Reading his posts on his wife's miscarriage and pregnancy shows that he is very supportive and strong. Their choice of names for their children is very unique too. If you want to know why, then better check the post here. Do come back here and let me know why I said the name choice is unique. This blog is indeed a very interesting read because you never get to encounter lots of men bloggers writing personal entries. And if for that alone, it is indeed worth a visit! Are You A Certified Travel Bug?